GrasZyme SugarBoost Forage Additive for grass silage has been developed for effective grass preservation with animal performance as its primary focus. The ultimate aim from the use of GrasZyme is to deliver MORE MILK and MORE LIVE WEIGHT GAIN at feedout. It can be used for the silage pit and baled silage. How does GrasZyme SugarBoost work? Quality silage starts with quality grass cut at the correct growth stage to optimise digestibility and yield. The aim of preservation is to retain silage quality as close as possible to the grass being harvested and avoiding unnecessary ensiling losses. 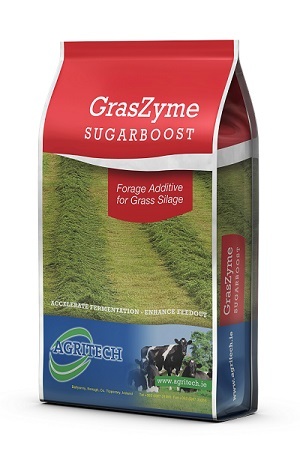 GrasZyme SugarBoost Forage Additive, with its multi strain homofermentative bacteria (L. plantarum, L. paracasei, P. acidilactici), working at different pH ranges makes GrasZyme SugarBoost highly efficient at dropping pH with the production of lactic acid. This silage inoculant gives a rapid fermentation with reduced energy loss and protein breakdown. Grass protein is made up of long chains of bound amino acids which is true protein. During the fermentation process the chains of amino acids are broken down reducing its benefits, so it no longer acts as a true protein. Furthermore, the amino acids can then be broken down to ammonia, which reduces intake and increases the pH. The role of GrasZyme is to speed up the fermentation process to ensure 20% less true protein is broken down, making it more available to livestock. Our Sales Director John Kenny discusses the benefits of using a silage additive. Reduction in energy losses from the clamp. Reliable even in low sugar conditions. To buy our GrasZyme SugerBoost forage additive, contact your local distributor.